I'm so excited to announce this!! 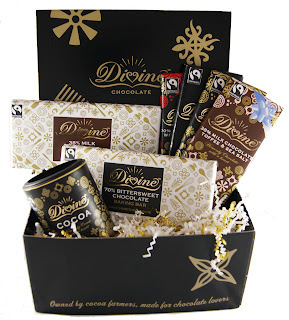 Divine Chocolate, the pioneering farmer-owned Fair Trade chocolate brand, is giving away three delicious Gift Packs to celebrate the debut of its baking range, which includes 70% Bittersweet Chocolate and 38% Milk Chocolate bars and pure Divine Cocoa. Each Gift Pack contains the Baking Range and a lovely assortment of Divine Chocolate bars. UPDATE: THIS CONTEST IS CLOSED AND WINNERS NOTIFIED - THANK YOU TO ALL THE ENTERED! MORE GIVEAWAYS ON THE WAY! I’d love to win a Divine Chocolate Gift Pack. Post a comment at the bottom of this blog saying you'd LOVE to win! Good Luck! Winners will be selected at random and notified by November 30, 2012. 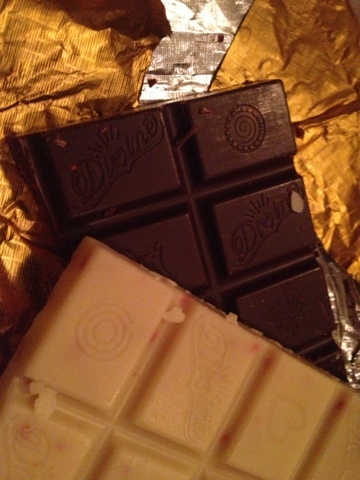 Divine Chocolate is responsible for delivery of the Gift Packs. This giveaway is open to US residents only.